Founded in 1876, Oshkosh Tent and Awning has been around only 100 fewer years than the United States. A lot has changed at OTA over the last 138 years, but not their commitment to providing quality custom canvas products. 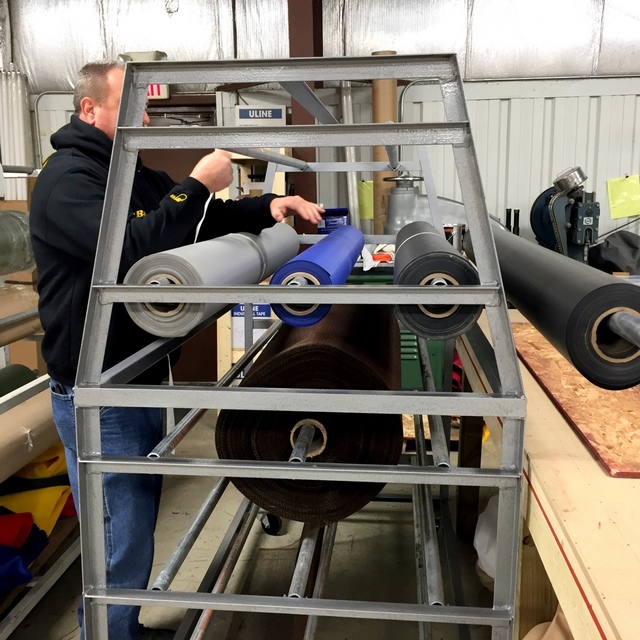 The company has a diverse product offering ranging from agricultural canvas to awnings to athletic gear, as well as many other contract canvas goods. 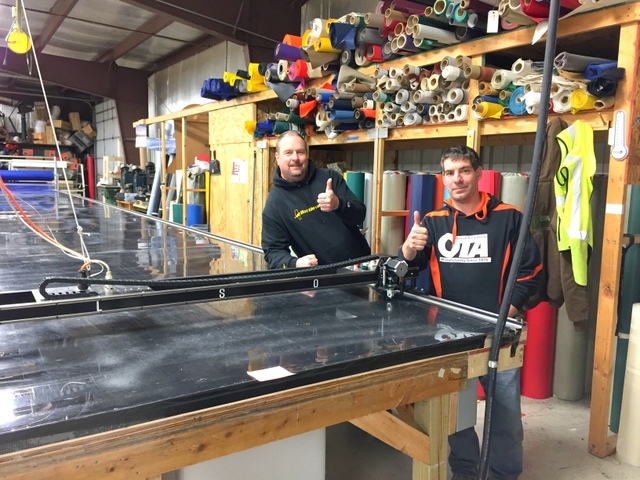 Brian and Rick give a “Thumbs Up” next to their PT-108″ Plotter/Cutter on a home-built 40′ long vacuum table. 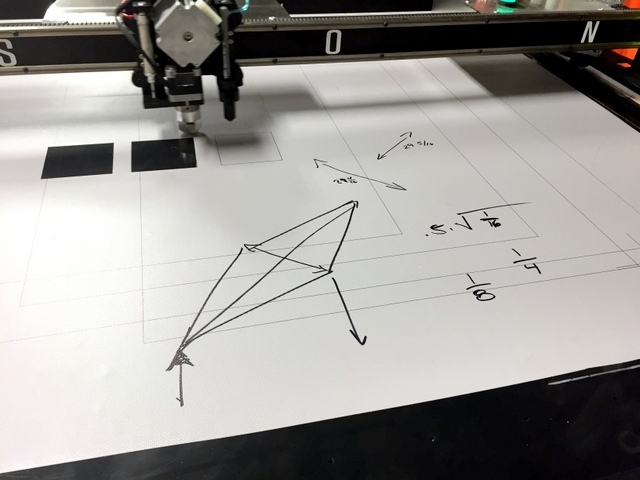 In the last couple of years, OTA has received several orders large enough to easily justify purchasing an automated Plotter/Cutter. Unfortunately, in the classic chicken-and-egg problem – by the time the received the job they were too busy filling the order to think about improving their manufacturing processes. 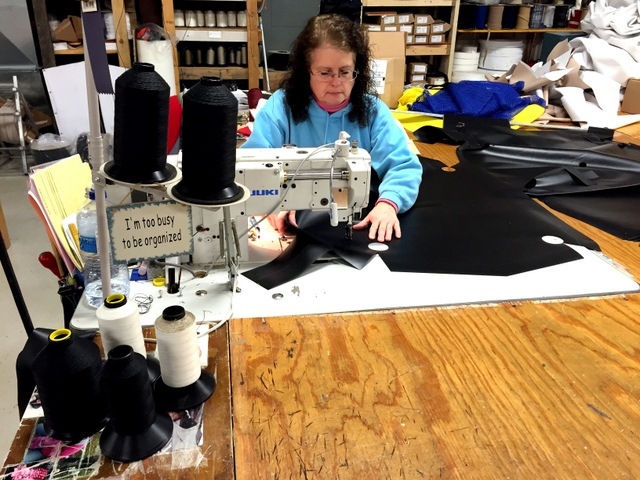 With several big contracts out for quote and the recent success of their programmable sewing machine, they decided 2014 was the year to automate their Plotting and Cutting! 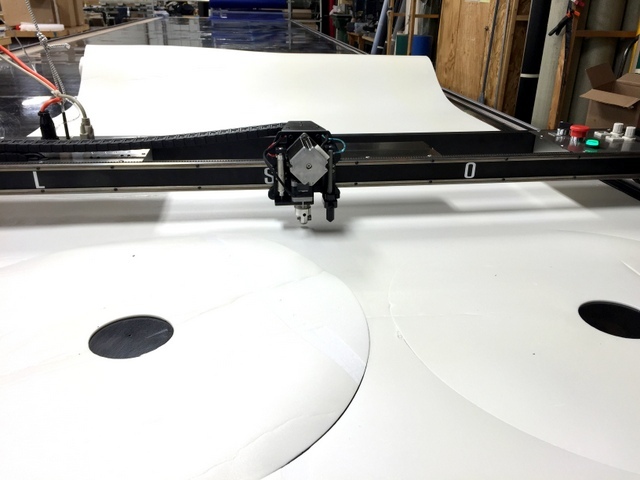 Brian decided to automate his marking and cutting with the Carlson PT-108″ Plotter/Cutter. 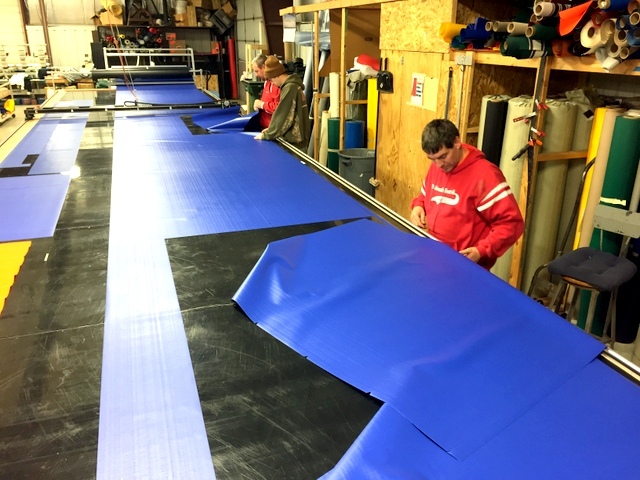 He selected our 108′ wide system because it can plot and cut up to 98″ wide material – allowing them to cut all of their traditional width material, as well as two 48″ wide barn curtain panels laid side-by-side and 96″ wide shade cloth. 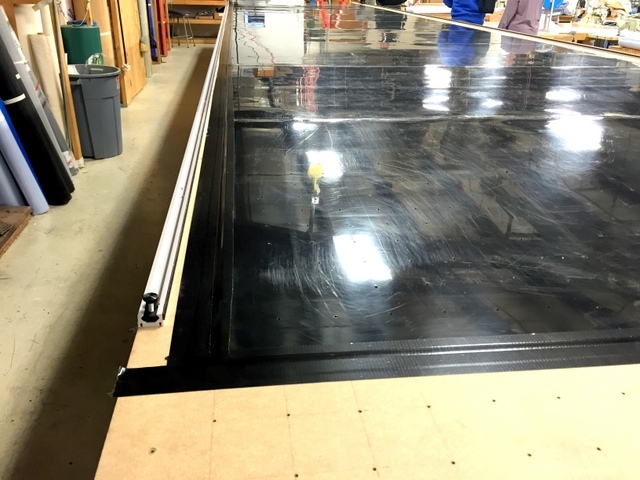 To save cost and reduce implementation time, they chose to convert their existing cutting table to a vacuum table by building a plenum (box) on top. After the first month, their operator, Rick, reports they have run their Plotter/Cutter over 16 miles, running it almost all day, everyday. In this blog we will review how OTA integrated our Plotter/Cutter into their operation and review ten starter projects we successfully cut right away! 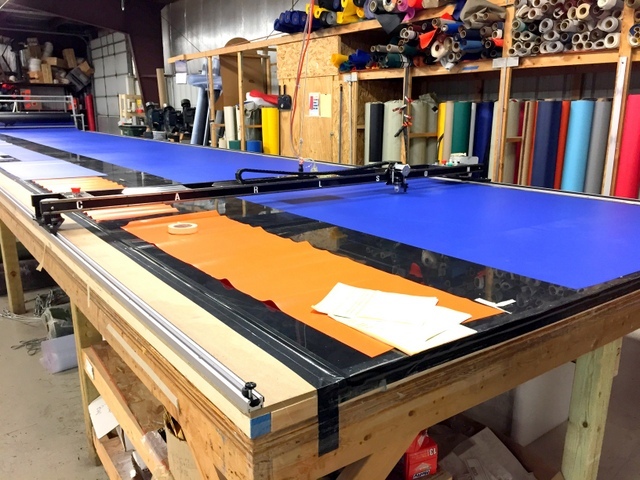 We begin by looking at their setup: a Carlson PT-108″ Plotter/Cutter on a home-built 9’x40′ vacuum table, operator”s workstation and monitor. Next we’ll walk through cutting 10 different applications with pictures and videos. Finally, we end with a detailed step-by-step look at their installation. 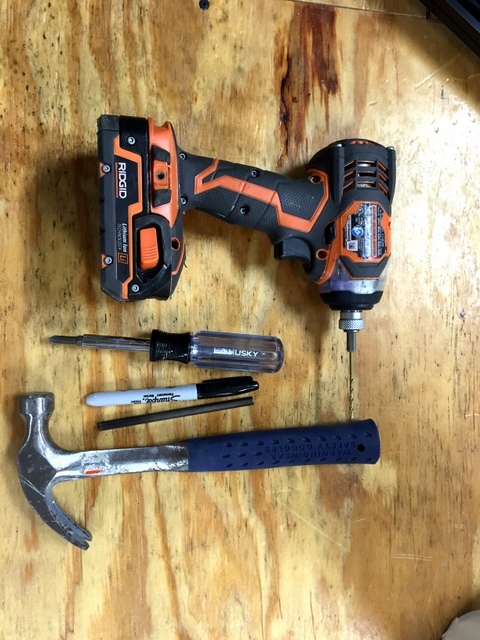 Our Multi-tool cutting head has magnetic mount tool holders and a universal pen holder. Quick-change tools allow OTA to mark and cut a wide variety of goods. Operator’s workstation with monitor. 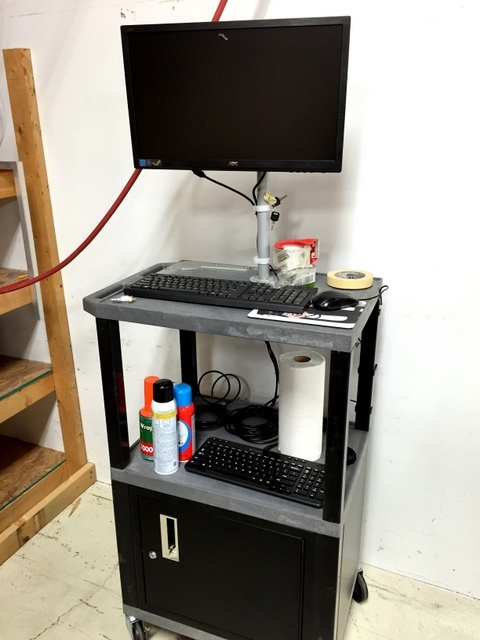 This rolling cart has ample workspace, a locking storage cabinet, and is on wheels for easy placement. 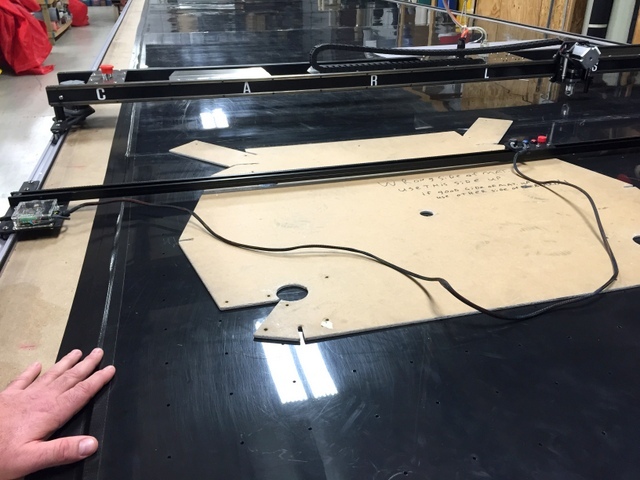 The Black HDPE cutting surface looks great! Now let’s look at their projects. 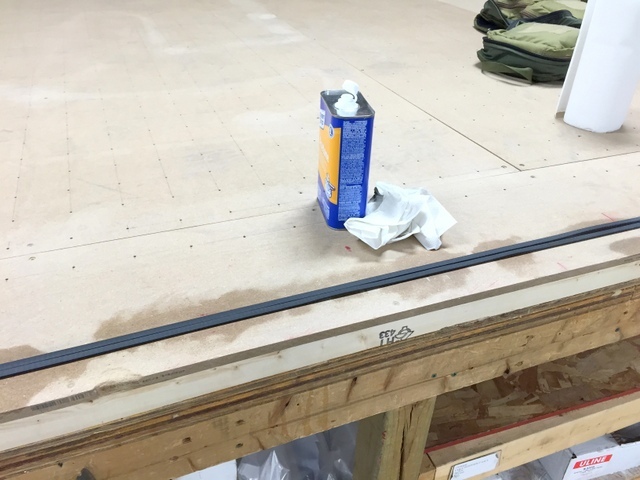 For the first project we plotted and cut a radiator cover for a military vehicle. For practice and comparison, OTA digitized the original cardboard pattern, even though they had already had it drawn in AutoCAD. This is a time consuming pattern to cut by hand, so they were very excited to have all of the pieces for the job digitized, nested, in a folder labeled with the job name and ready to cut. When OTA gets a new order, they simply spread material, select the nest, and click “GO”. They digitized a cardboard radiator cover pattern. They also drew this pattern in AutoCAD, so it was a great chance to compare the two. 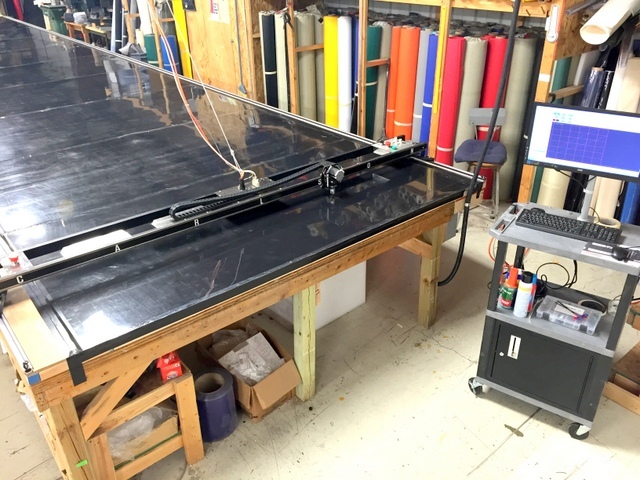 The T-Bar is so easy to use anyone in the shop can create digital patterns. Brian had already drawn this pattern in CAD before we arrived. 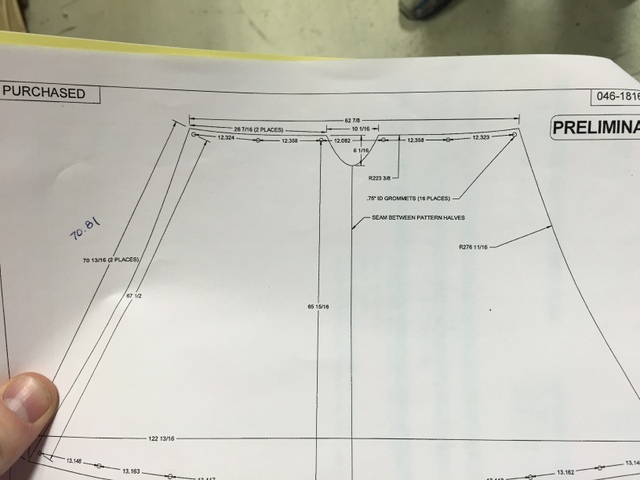 The best way to learn CAD is to start drawing a REAL pattern. Once digitized, we plot and cut a single cover to make sure everything was running smoothly. 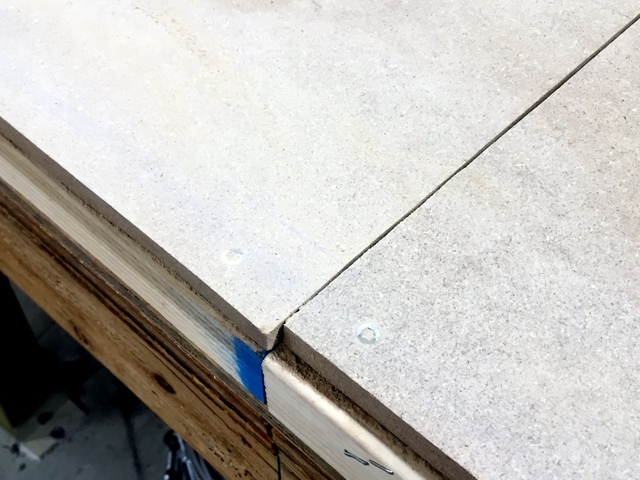 Remember, this is one of our first cuts of the install. Checking the cut pattern against the cardboard original. They Fit! Next we nested all of the parts for a single cover. 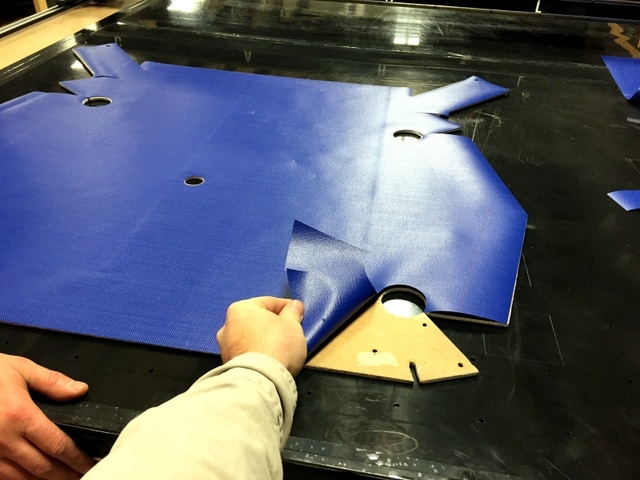 We cut it out of 18oz vinyl using our carbide drag blade. The true test of a good cut is the finished product. They sewed all the pieces together and confirmed everything fit before cutting a full nested table. CLICK HERE TO WATCH A NESTED SET QUICKLY CUT! These covers are for REAL ORDERS. That means even though we are training we are also getting production cut! 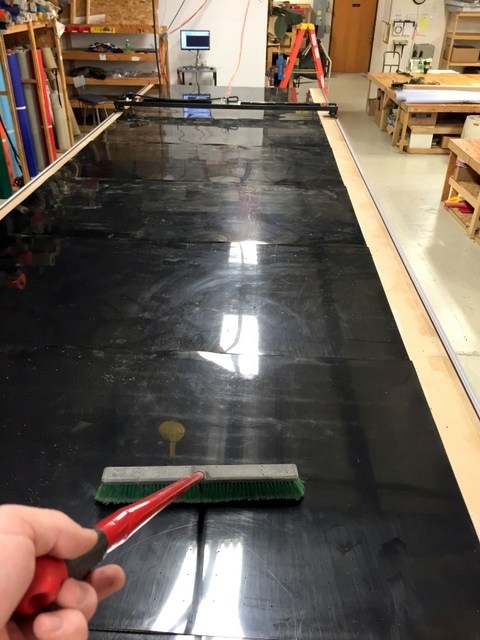 OTA built a 40′ long vacuum table to accommodate their 38′ long nested vinyl wall pad patterns in one cut. 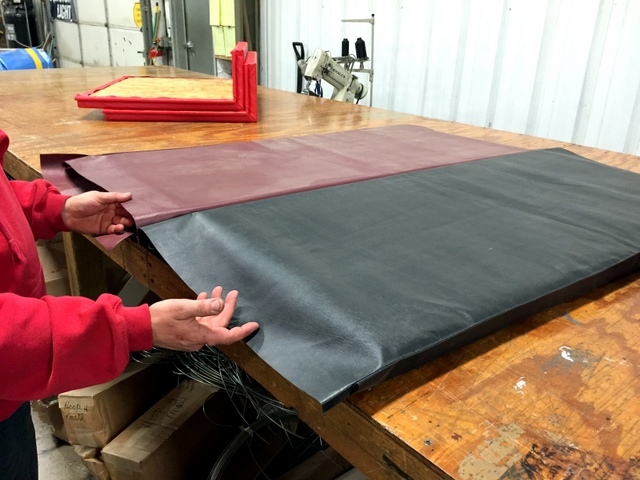 Cutting pads is now as easy as 1. spread material, 2. Select the pattern, 3. Click “Plot”. Pads are quickly plot and cut. 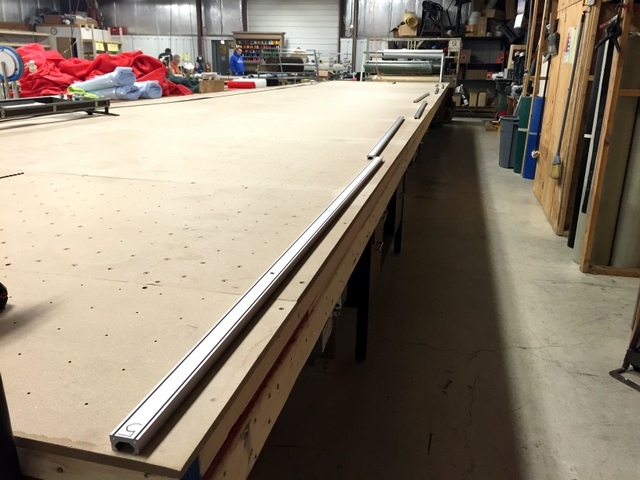 They built a 40′ long table specifically to be able to cut a 38′ nested pad set in a single run. Cut parts lift right out. Seam lines perfectly marked and corners cut perfectly square. Even cutting strips for the pads is made easy with the plotter/cutter. What would have taken hours, now takes minutes. In addition to reducing cut time, clear marks and straight cuts allow for faster sewing and assembly. Many of OTA’s vinyl gymnasium pads have custom logos or lettering stenciled and painted. 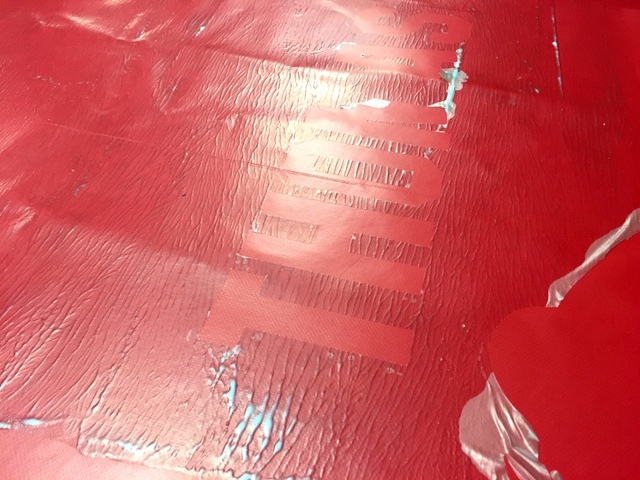 This tedious and time-consuming process required covering the vinyl in a paste and hand cutting the outline of the desired logo with a razor blade. Using the Plotter/Cutter’s depth-adjustable drag blade OR our kiss-cut Swivel Sign Knife, the Plotter/Cutter makes quick work of this job. Cut and peeled “Thomas” out of the vinyl stencil “goup”. The depth adjustable blade prevents cutting into the vinyl. These custom tool bags are built to order. They might look simple, but it is necessary to mark every sew line so the seamstress can make the right size custom fitting pockets. Once digitized, these marks are made with a soap stone mounted in the Plotter/Cutter’s pen holder. This way it is easy to erase. 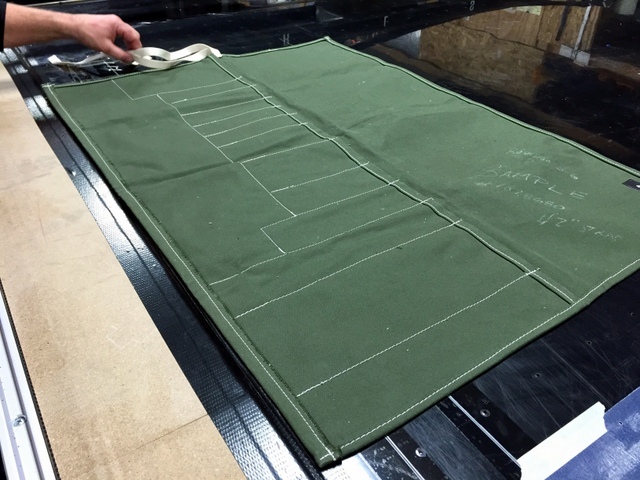 Custom tool kits are made too order from paper patterns. Once digitized, they can be quickly and accurately marked and cut using the Plotter/Cutter. 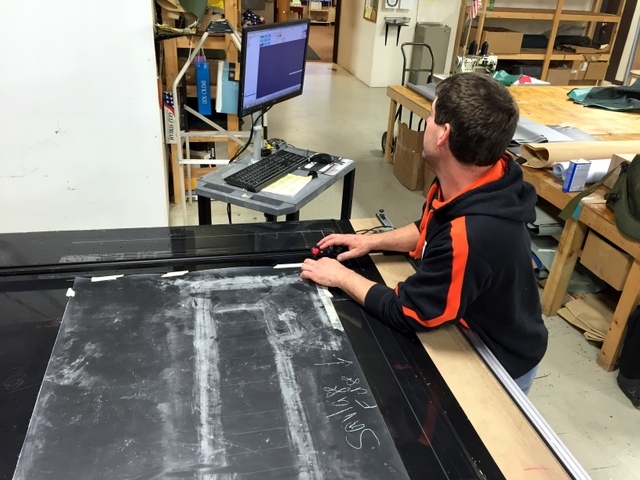 Rick is digitizing their canvas pattern using the T-Bar Digitizer. 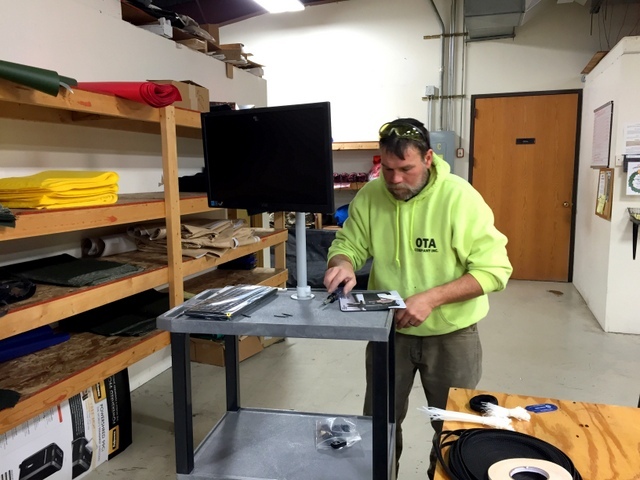 Their operator’s workstation is on wheels, making it easy to re-position when digitizing. CLICK HERE TO WATCH THIS BAG BE QUICKLY PLOT AND CUT. 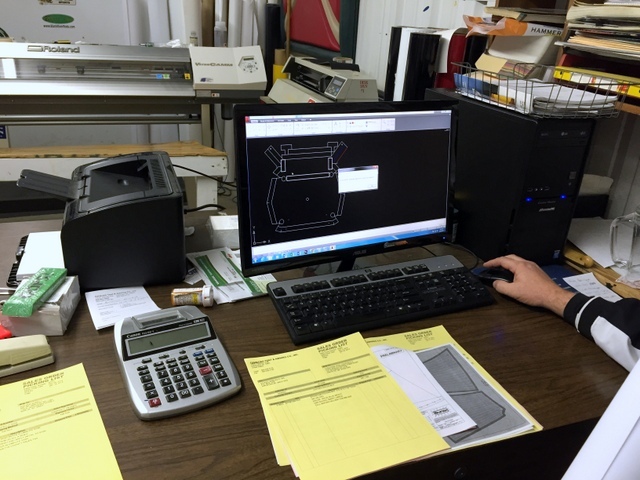 Digitizing is easy, allowing anyone in the shop to move physical patterns into the computer. There is a button for digitizing plot and cut lines. 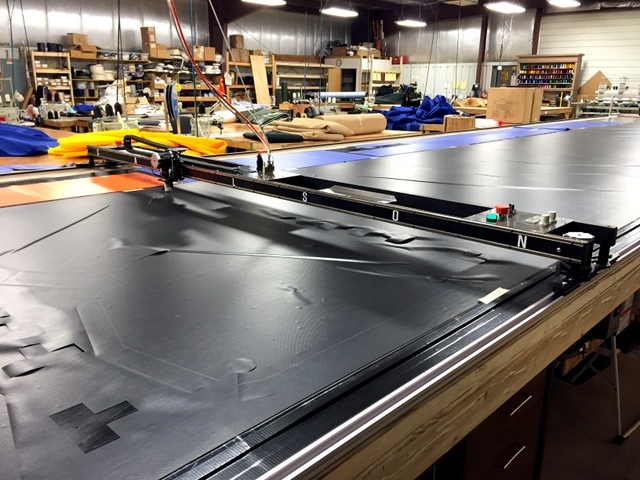 OTA recently began cutting shade sails — a perfect application for the Plotter/Cutter. 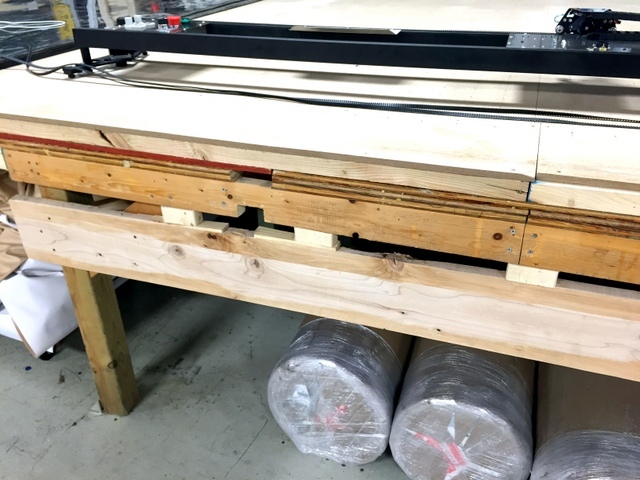 Using their 9′ wide Carlson Plotter/Cutter, it’s now as easy as importing their client-supplied CAD drawing and pushing the “Go” button. A perfect sail cuts in minutes. 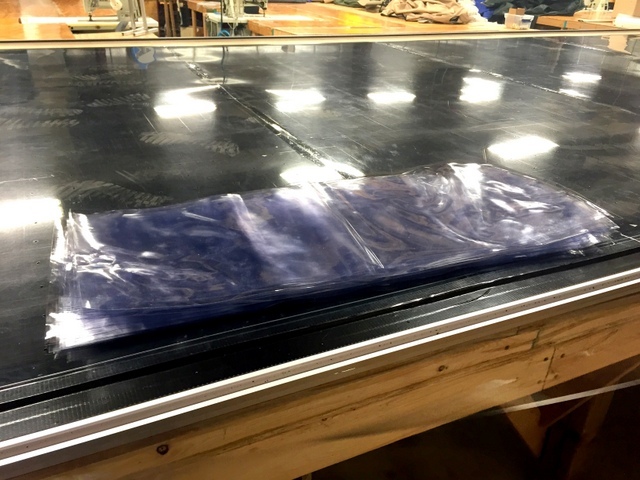 Shade cloth, at wider widths, is relatively heavy and therefore does not need to be vacuum bagged during cutting to prevent material shift. However, it is a good idea to slow the cut down to prevent any movement. Even a slowed Plotter/Cutter will still cut 5-10 timers faster than hand cutting. 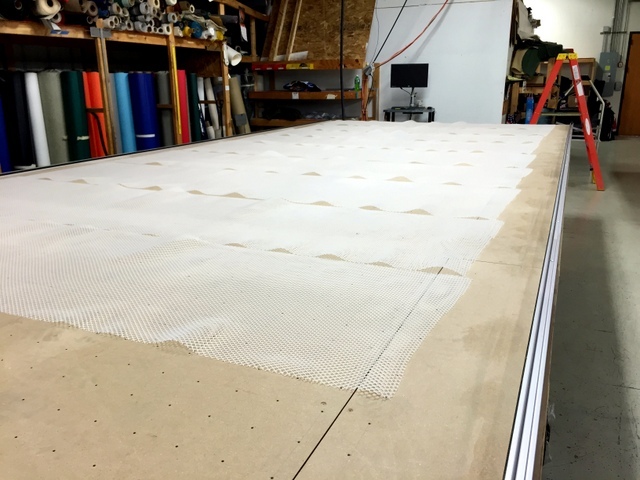 Shade sails have complex curves that are hard to cut out by hand, but easy to cut with a Plotter/Cutter. 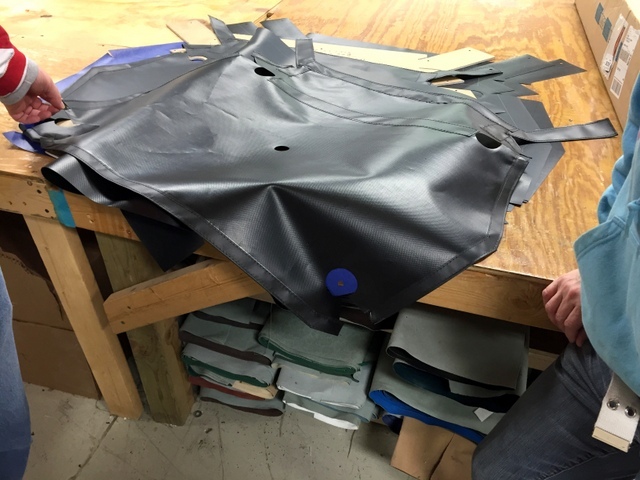 Every one of OTA’s shade sails need reinforcement patches for the corners made out of vinyl. We quickly draw their patches in Sketchup and then nest them to fill a piece of scrap vinyl. A full table of patches could be cut in one hour — something that would take over a day to cut by hand. Some of their mesh fabrics are very difficult to cut by hand due to their stretch and weave. The last time they cut this material by hand they cut over 1000 pieces wrong. With their Carlson they cut 120 squares in less than 2 minutes. 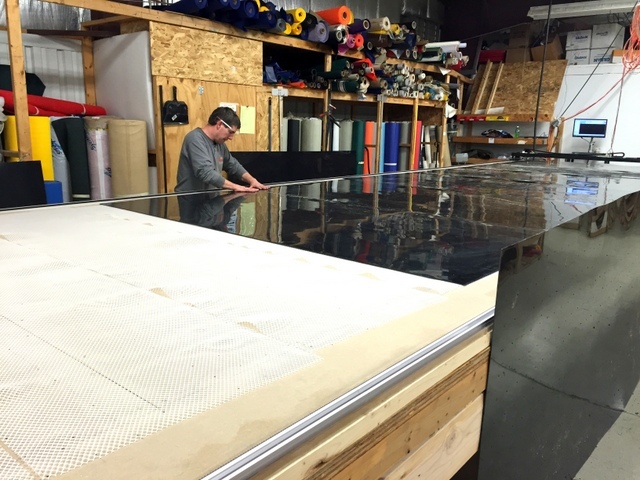 Our first test runs taught us that it is better to bag-and-cut smaller sections of this mesh, than to try to cut an entire table all-at-once. The material is very hard to keep straight and cutting a large nest increased the chance for material to shift or get caught under the gantry. 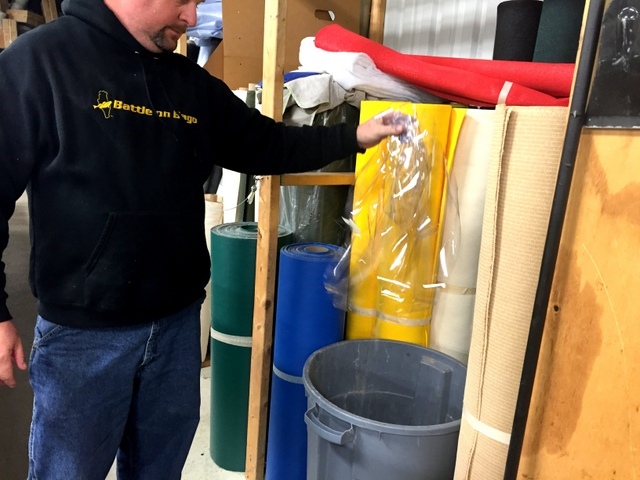 A thin mil plastic is used to secure some of their open-weave meshes during cutting. Cutting diving bags by hand is very difficult. It’s hard to measure on the fabric and impossible to mark. However, cutting using the Plotter/Cutter is a breeze. 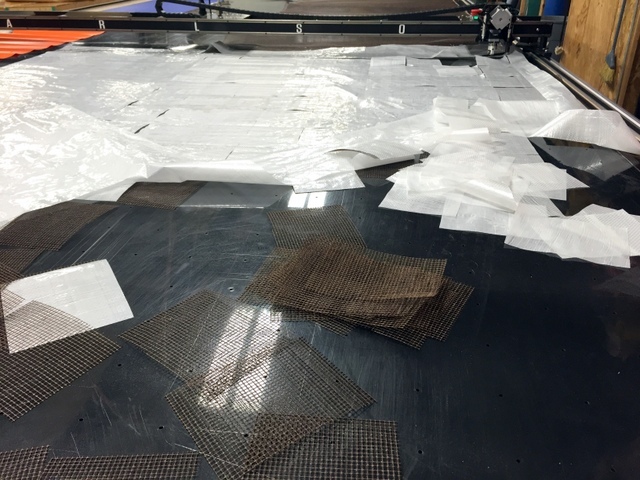 The material laid flat without us needing to vacuum bag during the cutting process, which allowed us to cut an entire order of bags in minutes, not hours. 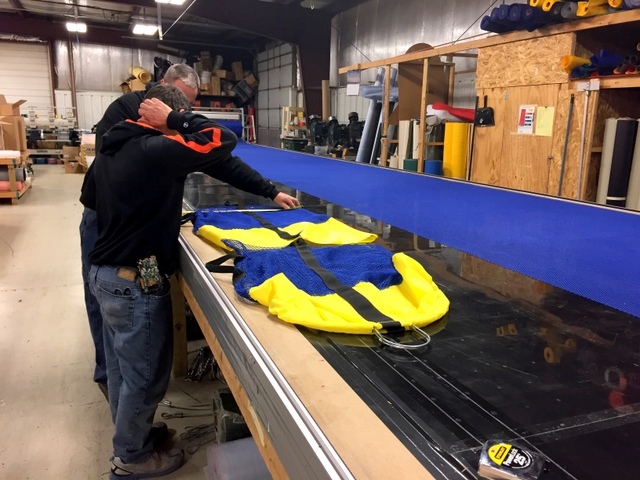 These mesh diving bags are very difficult to cut by hand, but very easy to cut with the Plotter/Cutter. Open weave meshes are difficult to cut square by hand. 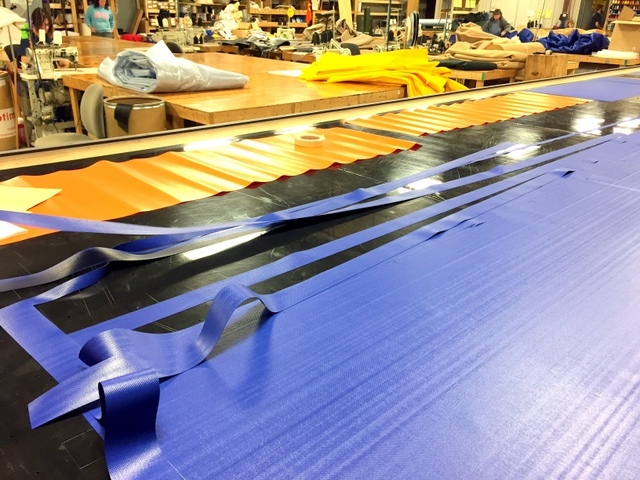 Using our Plotter/Cutter every bag is quickly cut with precision and accuracy. OTA cuts strips out of urethane to make sleeves to hold job tickets. 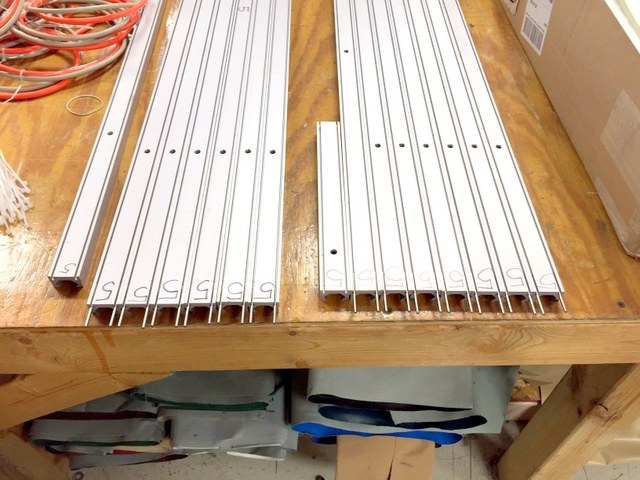 This is a simple project to cut — it’s only rectangles — but Rick says using the Plotter/Cutter, “Saved a load of time”. That’s because it’s easy to design simple shapes in our Patterns tab and an entire table will cut in minutes with the click of a button. No measuring. No waste. Every cut is exactly the same. These square cuts make sewing faster too, because the sewer does not need to correct for any error. This is a simple project, made quick and easy using the Plotter/Cutter. Now anyone in the shop can cut these parts without scissors or a measuring tape. Waste from a full 40′ l nested table. 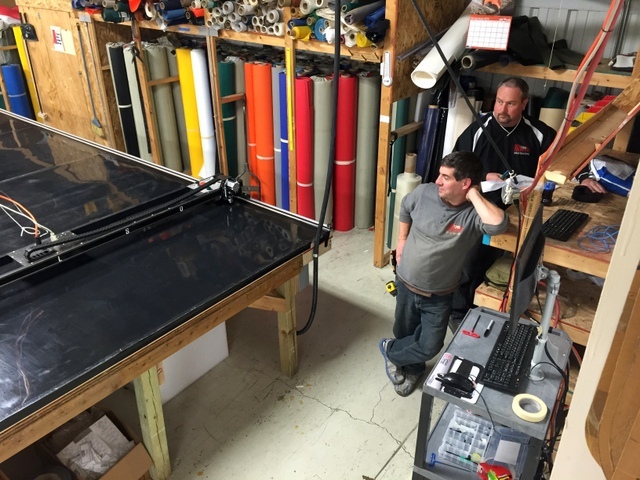 They use their vinyl printer to print product labels that are sewn onto every product. These are easy to cut by hand, but it takes time and a watchful eye to make everyone cut square and clean. Using the patterns tab we made a grid of rectangles 3 x 51. The Plotter/Cutter cut these 153 labels in less than three minutes! 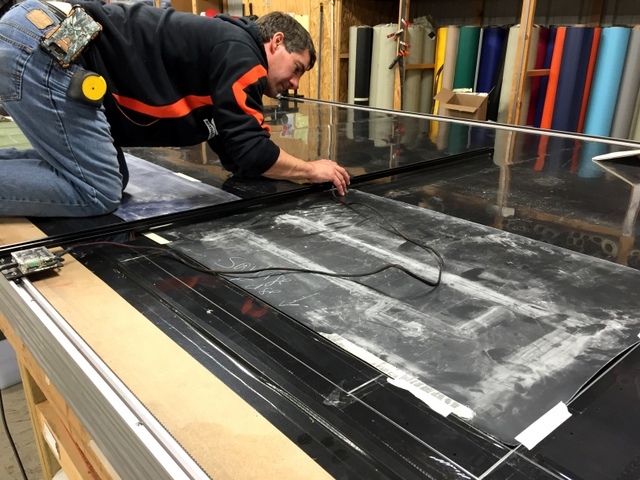 Using a high-lift rotary blade holder they can cut up to 1/2″ thick foam. It’s easy to cut foam inserts to match their vinyl covers. CLICK HERE TO SEE THEM CUTTING FOAM! That’s a lot of projects covered in our three days of training. Before we go, let’s take a quick look at how they setup their machine. 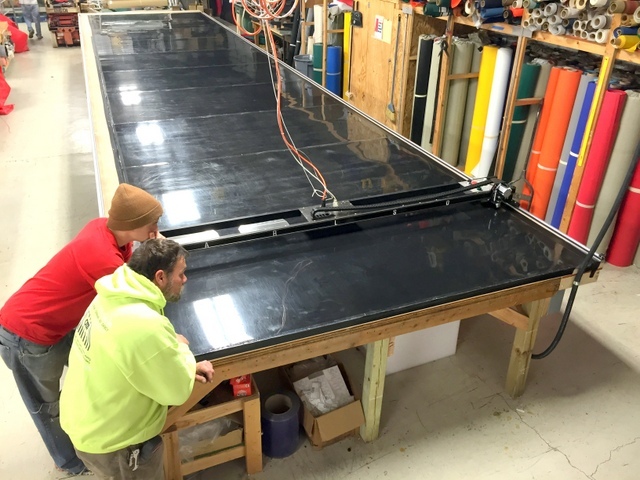 Our system arrives in one piece, having been well packaged on an overs-sized skid. 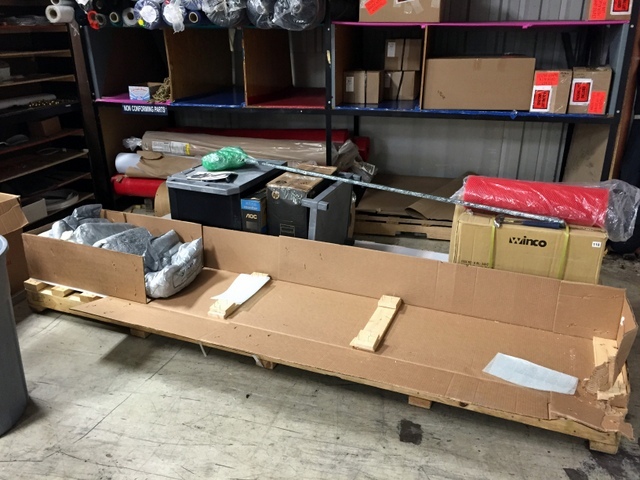 We recommend immediately unpacking the Plotter/Cutter to confirm there is no damage and all accessory boxes are present. They build their own vacuum table on top of an existing table. 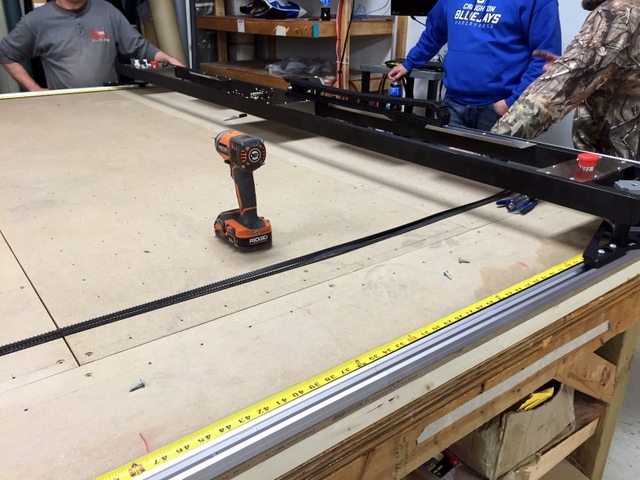 It is very important the edges of the table are level and flush so we can mount our track. 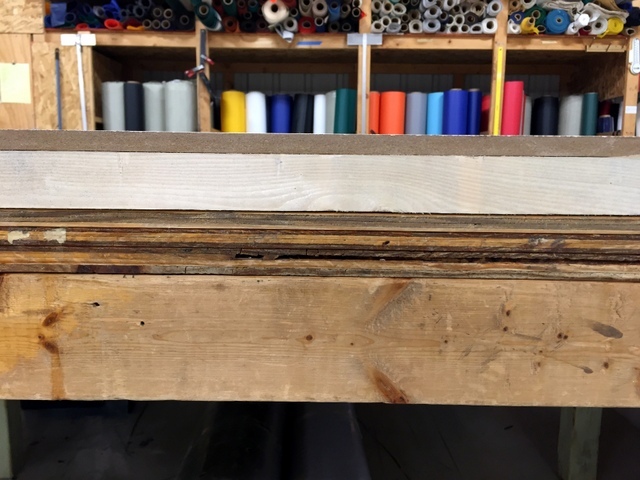 We inspect all table seams and recommend several that would benefit from a little more smoothing and sanding. Note how they built their vacuum table directly on top of an existing table. This saved time AND money. 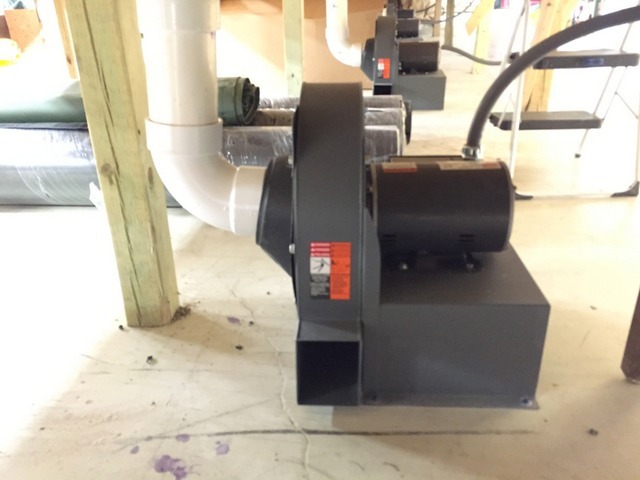 We shipped their blowers when they started their order. This gave them plenty of time to have them assembled, plumbed, and wired before we arrived. 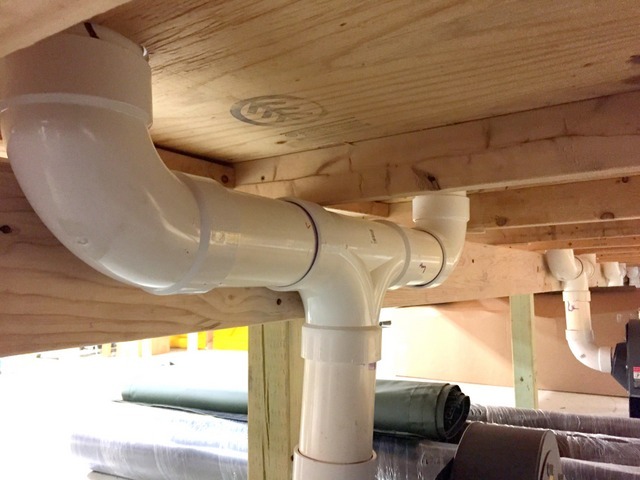 Plumbing consists of 4″ PVC sourced from your local hardware store. 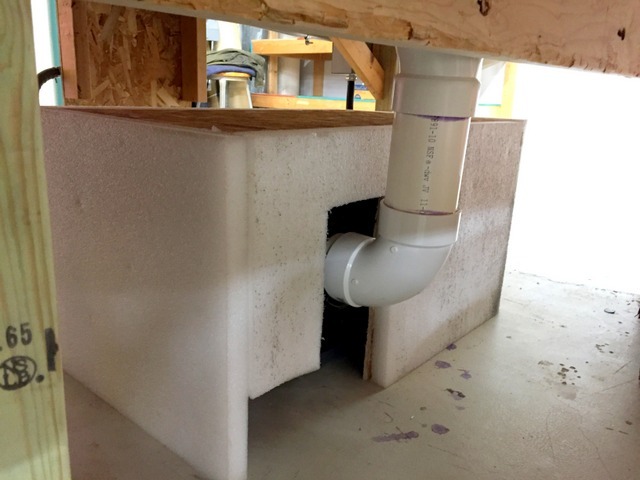 They insulated their first blower with foam and plywood. 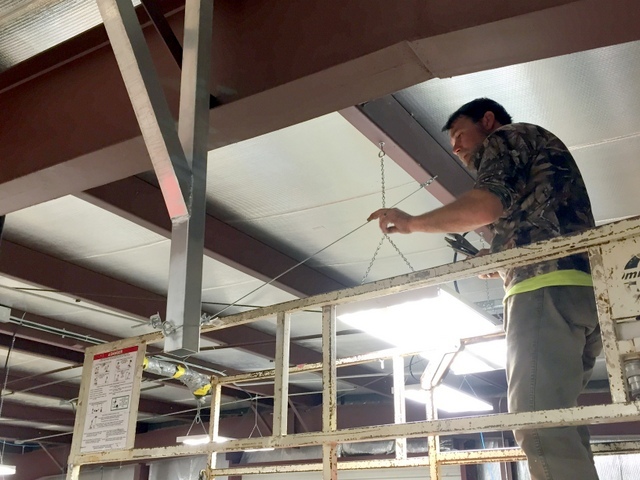 This resulted in a significant reduction in ambient noise. 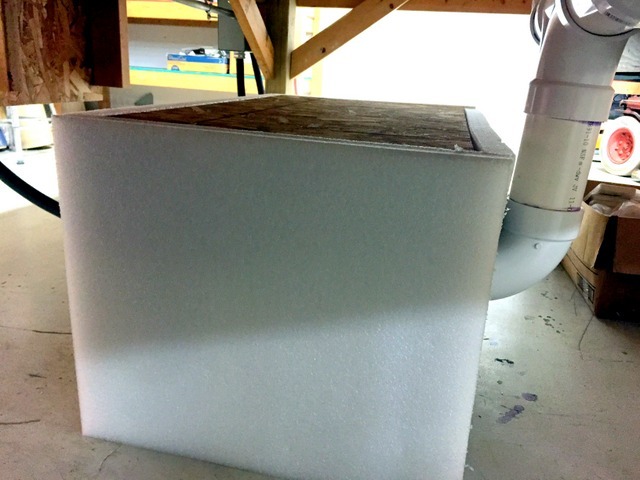 You can reduce blower noise by building an insulated box around the blower. A skirt around the edge of the table can also help. 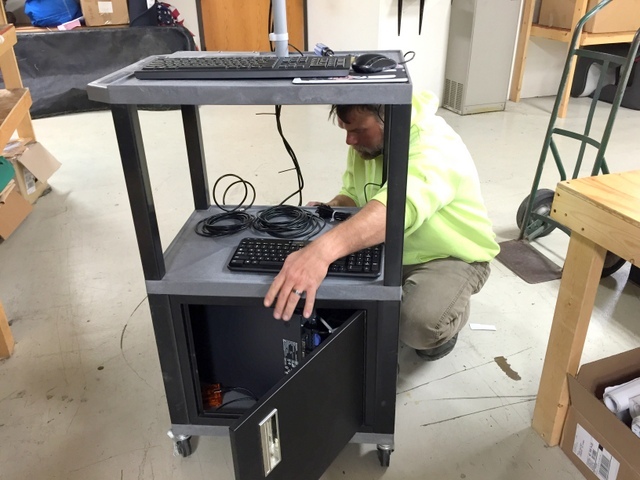 The computer, computer wire, USB controller, and other accessories are safely stored in the carts locking cabinet. Organize track sides A and B. Loctite pins according to the manual’s track layout diagram. Ziptie control, air, and power cables together. We recommend placing a zip tie every 18″. Run overhead cabling. 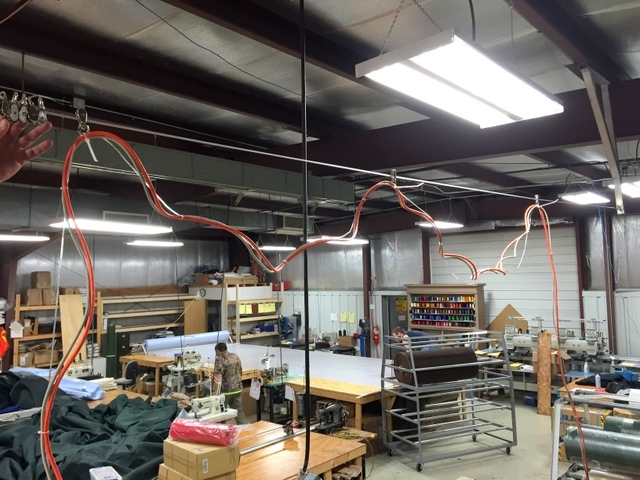 OTA created a frame that extends down from the ceiling to attach their overhead cable management wire. 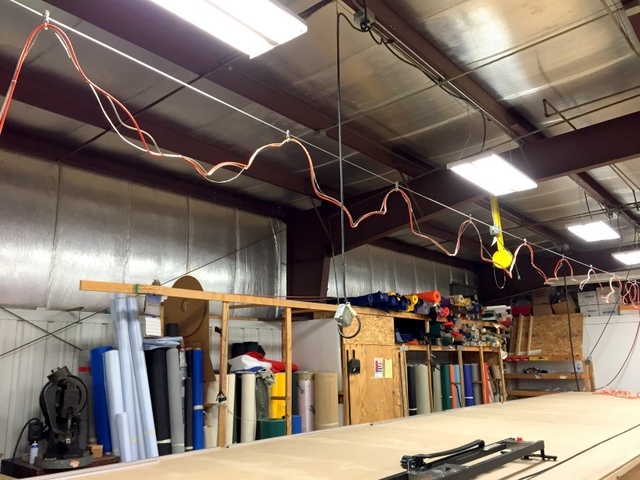 Hang control/air/power cable from pulleys. 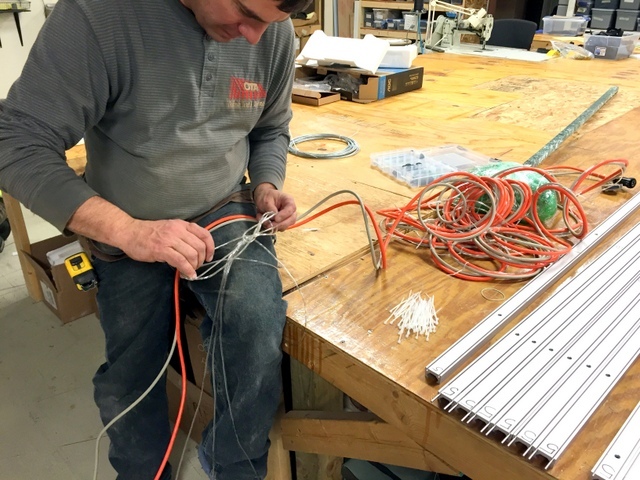 When possible, we recommend securing the cable every 4′, with about a 2′ drape. Clean drive belt with acetone to remove grease and residue, This improves adhesion to track. Layout track side A. It is very important that everyone near the track be reminded NOT to lean on, grab at, or drop the the track while it is on the edge of the table. 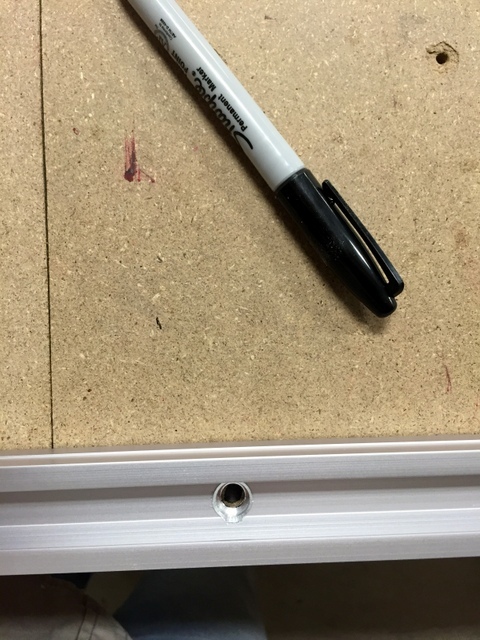 Once aligned, mark the track screw hole centers. 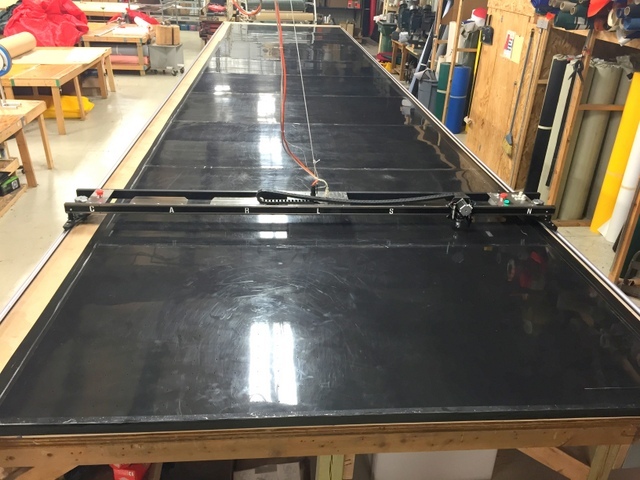 This way, even if the track shifts during installation you can quickly move it back into place. Attach track. Punch and drill a pilot hole. Hand screw track screws to prevent over tightening. Place track side B on the table and align. 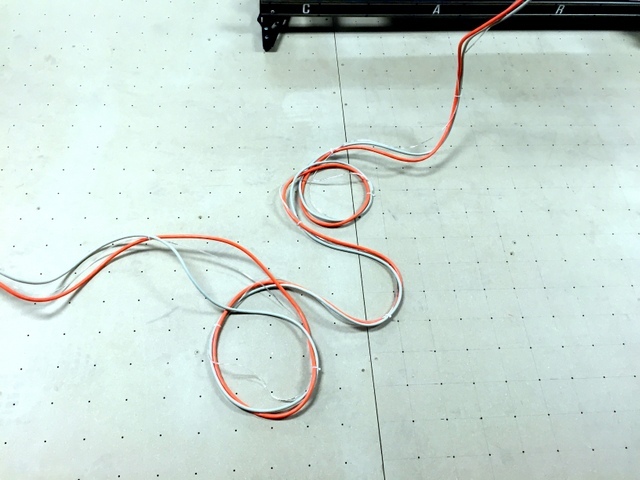 Before securing, mount your Plotter/Cutter on the track. 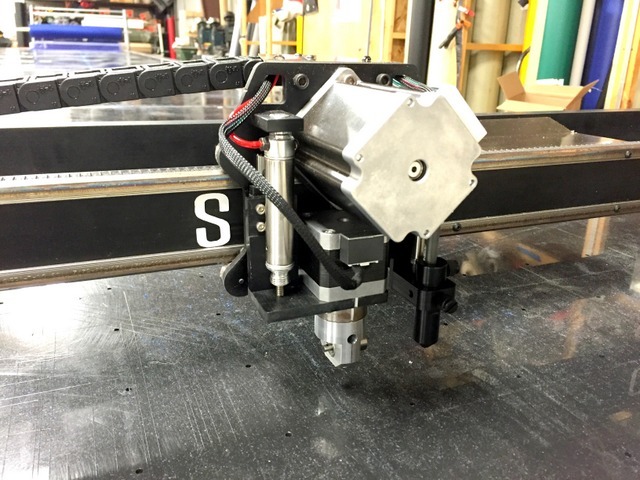 The Plotter/Cutter will be used as a jig to align side B with side A. We recommend running two tape measures parallel with side A and B. As you advance the Plotter/Cutter down the table the tape measure will help you keep the machine square. 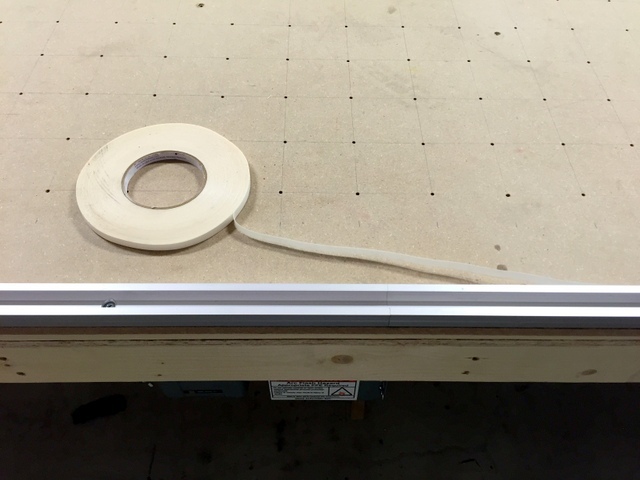 Attach double-sided tape and track belt to track. 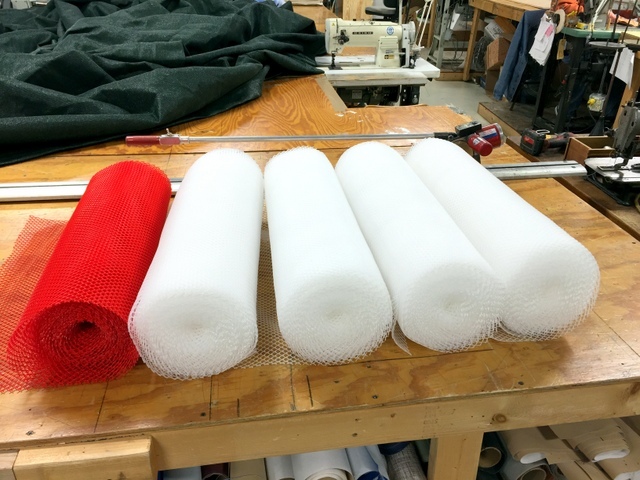 Unpack breather mesh rolls. 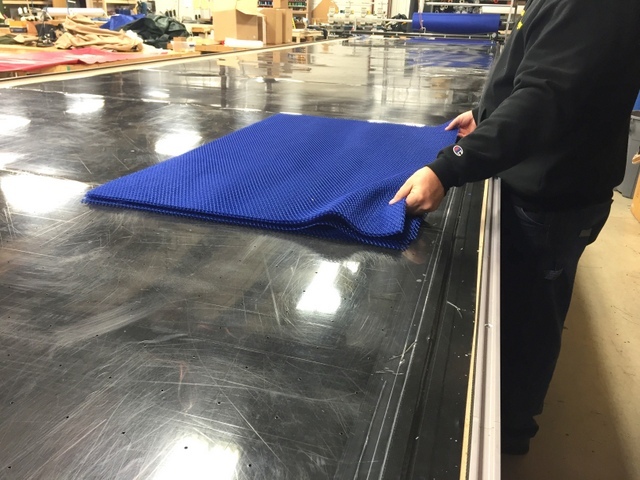 If providing your own mesh, we recommend a thick, open weave material. Spread mesh rolls across the width of the table. Make sure the mesh does NOT overlap. 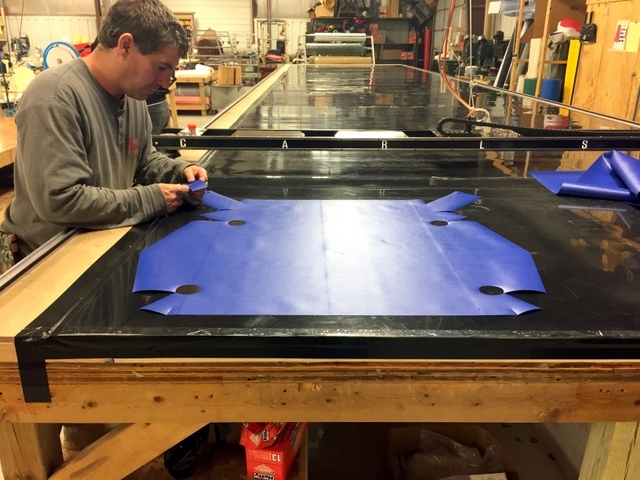 Carlson Design tables come with HDPE cutting surface drilled to order. 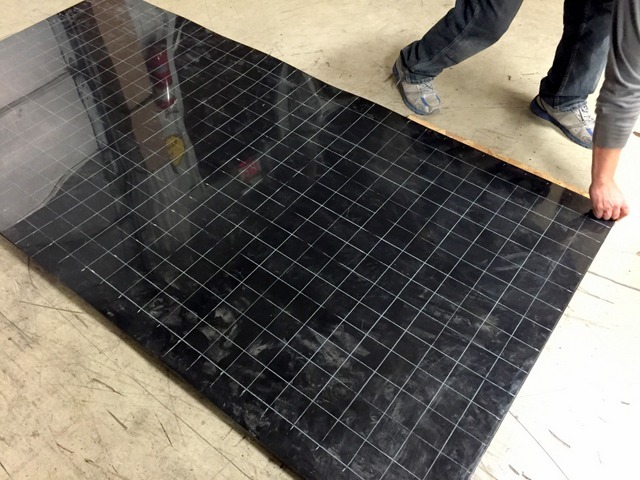 If you decide to provide your own cutting surface, you will need to drill a 3″x3″ grid in all sheets. Mount plastic cutting surface. When setting, be careful not to shift the breather mesh. Tape all edges to prevent leaks. 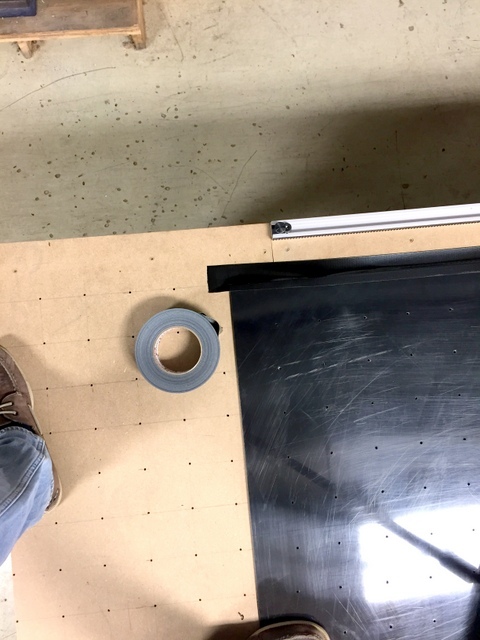 Their black cutting surface looks great secured with black masking tape. Sweep table to remove any debris from the install. Wipe out the inside of both track sides. Thumb’s up! You have successfully installed your Plotter/Cutter. It’s time for training! Brian gather’s everyone for training. Step 1: Calibrate, Check X/Y Offsets, and Square the plotter/Cutter. 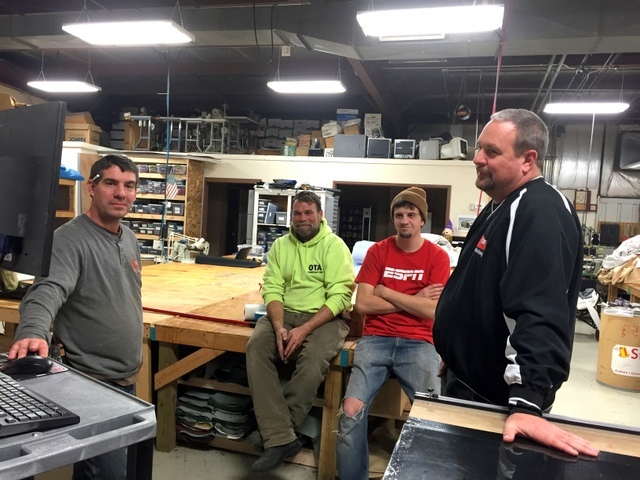 Training is a breeze with a great team! Glamour shot of their home built table! Big thanks to Brian, Rick, and Chris for helping make this a great installation! We can wait to see how many more projects they tackle with their Plotter/Cutter.